Posted on 8/15/2014, 9:31 am, by rackycoo, under General Projects. This weekend, alter your chandelier to fit your decor! SheridanLA took a brass chandelier and revamped it as shown here to suit her apartment. Later, when she relocated and wanted a more formal look, she transformed it again! 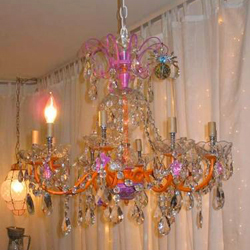 Check out her post to see the before photo, and to find out how the chandelier looks now. I love this chandelier. Such a great project and article.